Formerly known as Jack’s Neck, then Bellport, the town of Belhaven earned its official name in 1899 on the cusp of a new century. The “Beautiful Harbor” was and still is one of the prettiest riverfront locations on North Carolina’s inner banks. Its fine old homes, many built in the early 1900s, dot the banks of the Pantego Creek, where residents have enjoyed watching the sun rise and set in spectacular glory for generations. In 1928, Belhaven was thrust into the national spotlight when it became the final link to complete the inland route of the Atlantic Intracoastal Waterway, connecting Beaufort to Boston, making it an ocean seaport. The waterways have defined Belhaven’s past, as well as future, providing convenient access to the Pamlico Sound and the pristine Outer Banks. What was once a thriving center for the seafood and logging industries, Belhaven entered the new millennial as a peaceful haven for recreational boating and fishing. Its abundance and diversity of wildlife make it a popular destination for birders and hunters, and its fertile soil gives life to beautiful residential gardens, as well as seed, flower and other commercial farming operations. Belhaven’s downtown is within easy reach of the waterfront, with quality shops and services and a variety of restaurants and other services just a walk away from local marinas and the town docks. North Carolina’s oldest town and first capital is just a short drive away from Belhaven. 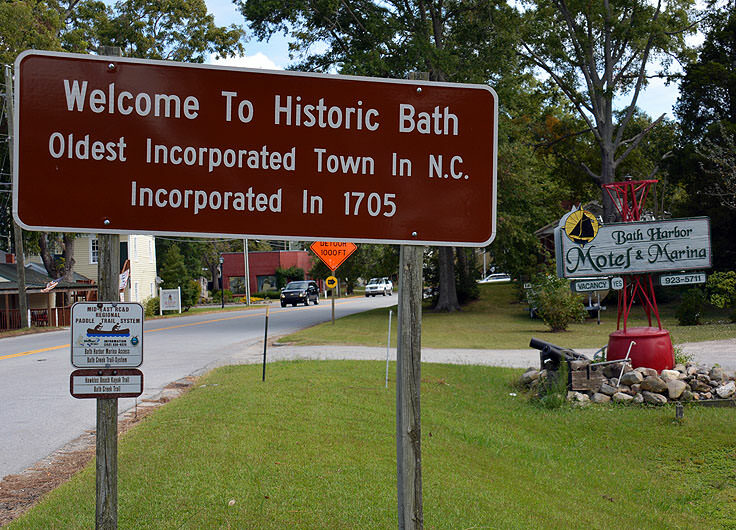 Well-known as a premier state historic site, with several structures listed on the National Register of Historic Places, Bath is a popular tourist destination. Its old town self-guided Walking Tour, historic house tours and community festivals attract visitors from all over the world. Old and young alike can walk in the footsteps of Bath’s most infamous resident, Blackbeard the pirate. Pantego Academy, also listed on the National Register of Historic Places, is located in the tiny hamlet of Pantego, just minutes from Belhaven. Originally a private school, built in 1874, it later was opened for public education. It has one of the only “horseshoe” stair steps still in existence.